But then, Beaver Island is a paradise for anything you choose to do there, whether it’s hunt, fish, boat, sight-see, or just lay on the beach. I knew that when I first visited there a few years ago-after four trips to the island, all of them highly successful and wildly enjoyable, I’m absolutely convinced. I can’t wait for the fifth trip. become a burgeoning flock of more than 600 very healthy birds. With an almost perfect habitat of hardwoods and open fields, much of that state land, an active winter feeding program undertaken annually by the wildlife club in cooperation with the Michigan Wild Turkey Hunters Association, which shipped 5 tons of shelled corn to the island last winter, and very few resident turkey hunters, Beaver Island is now facing a problem-too many birds. Of course, what constitutes too many is always in the eye of the beholder. For my oldest son and I, hunting the island over the course of three recent early May days, there was no such thing as too many gobblers to answer our tree yelps at dawn. In two full days of hunting, we called into shooting range three single toms and several large packs of screaming “teenager” jake gobblers, before my son, who held a tag for the general Unit 234 hunt, decided on a particularly nice bird that had instantly responded to my calling along with what appeared to be an equally impressive twin brother to stare us down from 20 yards away on public land near the southern end of the island. Too many?? Nah. Impressive?? You bet. But faced with a “town” flock of approximately 30-60 birds that freely wander the streets of the village of St. James on a daily basis, a phenomenon not uncommon in many northern Michigan towns, the full-time residents of Beaver Island are eager for something you don’t hear about too often any more-more hunters. Of course, you can’t hunt in town. That issue needs to be settled by the folks who live in town, who need to resist the urge to feed the birds and fill bird feeders year around. And there’s not much you can do about the large numbers of birds you’ll see hanging around barns with horses and other farm animals. But more than 2/3 of the island is, thankfully, still in public ownership. Private landowners are also, with few exceptions, more than amenable to a polite request for short-term hunting privileges. 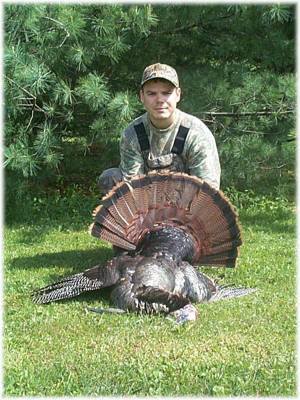 We still have several weeks left in Michigan’s spring turkey hunting season. If you’ve had problems finding birds on land you have access to, or have found yourself surrounded by other hunters, as many of us have this year, there is a solution-Beaver Island. And don’t look too closely at all the deer, squirrels, ruffed grouse, waterfowl, or other wildlife the island abounds with, or drool too much at the island’s seven inland lakes that offer superb walleye, bass, pike and panfishing. If you do, you’ll find yourself like me, eager to head back to paradise. Right here in Michigan.